1.3 oz soft baked cereal bar. Strawberry flavor. 120 Calories per bar. 8g of Whole Grain. 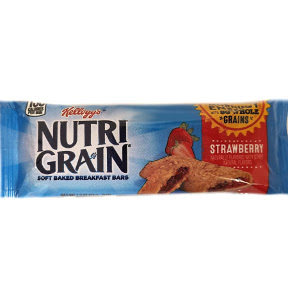 Ingredients: Crust: whole grain oats, enriched flour (wheat flour, niacin, reduced iron, vitamin B1 [thiamin mononitrate], vitamin B2 [riboflavin], folic acid), whole wheat flour, soybean and/or canola oil, soluble corn fiber, sugar, dextrose, fructose, calcium carbonate, whey, wheat bran, salt, cellulose, potassium bicarbonate, natural and artificial flavor, mono- and diglycerides, soy lecithin, wheat gluten, niacinamide, vitamin A palmitate, carrageenan, zinc oxide, reduced iron, guar gum, vitamin B6 (pyridoxine hydrochloride), vitamin B1 (thiamin hydrochlorider), vitamin B2 (riboflavin). Filling: invert sugar, corn syurp, strawberry puree concentrate, glycerin, sugar, modified corn starch, sodium alginate, citric acid, dicalcium phosphate, methylcellulose, natural and artificial flavor, caramel color, malic acid, red 40. Contains: wheat, milk and soy ingredients.